This is a rough sketch of a graphite and charcoal figure commission that I started today. 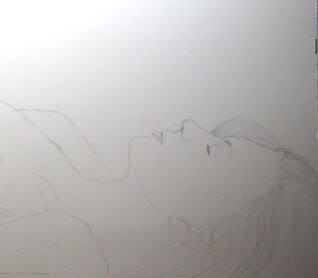 I did several rough sketches in charcoal first but this is the rough sketch on the arches paper. The photo is very tricky as the lines are so light and all the white space messes up the balance but the next update should have a better photo as there will be more graphite on the paper. The full portrait size is 16x30".